Slovenia is a young dynamic country, looking for more and more opportunities and integration within the European Community. The refractory business has here long tradition roots and some manufacturers proudly records over 50 years of successful activity. Having received the approval by the PRE (European Refractories Producers Association) on its General Assembly in June 2011, the association has the scope to cooperate with other associations and working groups in order to update on market general information and keep the Slovenian players on line with the last international industry standards and trends. Erik Zobec, Seven Refractories Managing Director, has been nominated director of the new association and he proudly represents it at EU level. 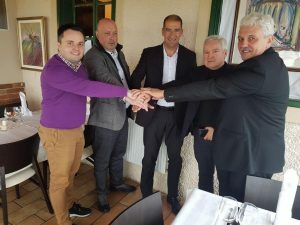 On the fifth anniversary of its founding, the association confirmed its fifth member and extended the activity area to the neighboring Croatia. The company Zagorka Ltd. from Bedekovčina has been working in the field of clay and chamotte products since 1889. The company’s activity has been successfully extended from refractory products, fireplaces and stoves into the area of ventilated ceramic facades.